Have you ever thought about how so many different cultures use music as a form of worship? We all know of the wonderful choral music traditions of the Christians, the chantings of the Buddhists, the kirtans of the Sikhs, the emotional outpourings of the Sufis and the many traditions of musical worship of the Hindus. Some are simply sacred music, like bhajans, their primary purpose being worship. Others, like Carnatic Music, have a deep thread of devotion running through them but retain an identity apart from their devotional roots. So yes, the use of music as a means of worship is common enough. But it is not very common to have music itself as the divinity being worshipped. That is the concept which I approach in my post today. As a devotee of music, this concept pleases me greatly! To those of us who agree that divinity is omnipresent, this is no stretch of imagination. If divinity can be found everywhere, why not in music? To those of us who search for that spiritual feeling in places of worship to allow us to connect with divinity, this makes it even easier. For music is there, real and accessible to most of us in one way or the other. We need not search for places of worship; we may worship the music right within us. Sound as a divine principle comes to us Hindus from the Vedas. We all know the importance of AUM, I shall not venture there. The Vedas themselves are also called Shruti meaning ‘That which is heard‘, emphasising both their divine origin and their oral tradition. Samaveda, in particular, ‘the Veda of Songs‘ includes notated music, perhaps the oldest surviving tunes of this world. An interesting aside – the word vEd or knowledge comes from the Proto-Indo-Iranian word ‘weyd‘ meaning ‘to know, to see’. The Latin videō meaning ‘to see, perceive, look‘ comes from the same root word. So a sentence like ‘I have a video of the vedas‘ is etymologically quite amusing ! But I digress..
Coming back to the divinity of music, the Vedas refer to the divine nature of vAk वाक् or voice. This divinity is said to be present in AUM. The Upanishads refer to Shabda-Brahman शब्दब्रह्मन् meaning The Cosmic Sound. The word Nada-Brahman नादब्रह्मन् (nAda also means sound) is used instead of Shabda-Brahman in later treatises like Brihaddeshi by Matanga Muni (date unknown, speculated 6th-8th century CE). In this Nada is linked with various divinities. Without Nada, there is no music. Without Nada, there are no musical notes. Without Nada, there is no dance. Therefore the whole universe is composed of Nada. Brahma is known to be incarnate in Nada, as is Vishnu, Parashakti and Shiva. In Sangeeta Makaranda by Narada (~11 century CE), there is an explanation of the passage of Nada through our body. that nAda, passing through the naval, heart, neck, tongue, nose, teeth, and lips, generates the seven svaras, shadjam, rishabham, gAndhAram, madhyamam, panchamam, dhaivatam and nishAdam. There is a similar passage in Sangeetaratnakara by Saragadeva (13th century CE) in which the author links musical notes with Chakras (centres of spiritual centre within the body) and Nadis (subtle energy channels within the body), describing the passage of nAda through the body . Desirous of speech, the individuated being impels the mind, and the mind activates the battery of power stationed in the body, which in turns stimulates the vital force. The vital force stationed around the root of the navel, rising upwards gradually manifests nada in the navel, the heart, the throat, the cerebrum and the cavity of the mouth as it passes through them. R.K.Shringy explains that ‘Nada is not merely an object of the sense of hearing. The concept of nada refers to the perception when subject and object are not differentiated‘. Normally when we name objects, we are naming the perception of that object in our consciousness. As such, the subject in our consciousness and the object outside have a relationship but are always apart. Nada on the other hand refers to the melding of the sound and its presence in our consciousness, when they become one. Nada is both the energy and its manifestation. All this is but a lead up to my song choice of today. Tyagaraja has composed this masterpiece in homage to the divinity of music residing in the seven notes. He worships the divinities resident in the navel, heart, throat, tongue and nose, similar to the quotes from Sangeeta Makaranda and Sangeeta Ratnakara above. He refers to himself as the auspicious Tyagaraja; if for no other reason, surely the presence of the divinities within him makes this a just description! Set to the beautiful raga Jaganmohini (that which charms the universe), it is a favourite amongst Carnatic Music fans. I have chosen this song today for a particular reason. When Dr.Balamuralikrishna passed away late last year, I was travelling and did not write a post in his honour. One of my readers wondered about it in a comment but it was not really forgetfulness on my part. You see, as I have mentioned in previous posts, my childhood home always rung out with Carnatic Music. Be it Semmangudi, Madurai Mani Iyer, G.N.Balasubramaniam, M.D.Ramanathan, M.S.Subbulakshami, S.Balachandar, Lalgudi Jayaraman, Balamuralikrishna and myriad others, they were all voices of my childhood, familiar and very very dear. Over the years, one after the other, they have passed away. With each passing it seems that I wave goodbye to one more dear one, to my past, to my history. Dr. BMK was particularly dear to me because he was my mother’s favourite. I can never listen to him without remembering my mother’s pleasure in his voice. His passing adds one more goodbye in my life and deepens the sorrow of my own losses. Sigh! Shobhillu Sapta Svara is a song I associate with him and I selected it as a tribute to a man who was the ultimate Nadopasaka, a devoted worshipper of the Nadabrahman. Worship (bhajimpavE) the radiant (shObhillu) beautiful (sudurula) divinities (implied) of the seven (sapta) svara (notes), O mind (manasA)! Worship the divinities glowing (implied) in (andu) navel (nAbhi), heart (hRt), throat (kaNTHa), tongue (rasana) and nose (nAsa) etc. (Adula). Worship the divinities glowing in (implied) the sustaining (dhara) Vedas such as (implied) Rg, Sama etc. (Adulalo), in the heart (hRdayamuna) of the foremost (vara) gAyatrI mantra, in the minds (mAnasamuna) of the celestials (sura) and Brahmins (bhU-sura), and within (eDa) this auspicious (shubha) Tyagaraja (tyAgarAjuni) . Is it just, O Lord Rama, this whim of yours in not talking to me when I have held your feet with such devotion? O Merciful Lord! Is it not true that when the erudite Anjaneya saluted you, you asked your younger brother to convey the details to him? However, is this fair, this whim of yours in not replying to this Tyagaraja? Most of us who have grown up in India have a special place in our hearts for the epic Ramayana. Our behaviour, our beliefs, our language – all this and more are influenced by this great epic. However, if we are asked if Ramayana is myth or history, if it is legend or reality, many amongst us will be conflicted. I am. My heart believes, but my mind questions many of the incredible occurrences. I try and add my own reasoning (totally unproven!) to make it real, for I want it to be real. Take, for example, Lord Hanuman and the legions of Vanaras (apes) who have a starring role in Ramayana. ‘Talking apes? Really?’ My mind asks me. Given my beliefs, I feel both guilt and shame for asking such questions and then hasten to counter-ask myself ‘What if some Neanderthal men were still around at that time? Would they have been seen as another species i.e. as apes?’. The dates don’t fit, but what if? Evidently, I am not the only one who wants to find logic to fit the legends. I-Serve, the Institute of Scientific Research on Vedas seems to be populated by exactly the same kind of people. They were much in the news last year when they used astronomical dating of planetary positions mentioned in the Ramayana to get dates for some important events. 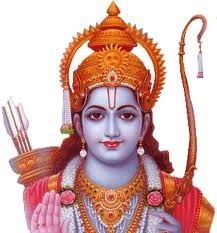 Lord Rama’s birthdate was 10 January, 5114 BC, they say with authority. Their paper is an interesting read for anyone interested in the Ramayana. So when I came to the topic of today, the first meeting of Lord Hanuman with Lord Rama, I see it in my mind’s eye as a somewhat mythical history, but history nonetheless. Before we come to Sarga 3 of the Kishkinda Kanda of the Ramayana, Sita is already taken. Rama and Lakshmana are on her trail. Dressed simply like hermits, they still have the appearance of princes. It is at this time that Hanuman is sent as a messenger seeking help from them by Sugreeva, the younger brother of Vali, the Vanara ruler of the region, who has now become Sugreeva’s enemy. Dressing himself as an ascetic in order not to alarm then, Hanuman approaches them. His speech is full of praise, as seems to be the polite form of address in those times, before introducing himself. Rama is well pleased with his greeting. 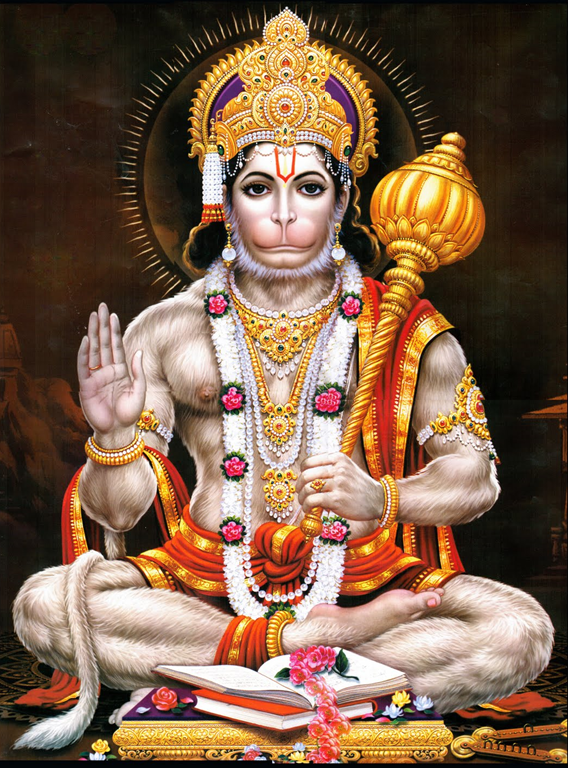 Turning to Lakshmana, he praises Hanuman’s knowledge of grammar and the Vedas. But he does not speak directly to Hanuman, letting Lakshmana be his spokesperson. This is believed to be the protocol of those times in dealing with messengers. For the verses and the translation, read here. Tyagaraja uses this incident in our song choice of today, Adamodi Galade, set to the charming Charukesi raga (to know more about this raga, click here). Tyagaraja asks Lord Rama if it is fair that he persists in his whim of not speaking to him and reminds him that it was thus with even Hanuman, that the Lord did not reply directly to him when spoken to. Does Tyagaraja imply that if the Lord would not speak to Hanuman himself, what chance did he have? Does he see himself as a loyal servitor of Lord Rama, just as Hanuman was and thus worthy of his love? He does seem to berate the Lord, calling him whimsical! For lyrics and translation, see footnote. To present this song, I am in the mood for some legends today. To start with, I present a rare live presentation from the musician whose Charukesi I love better than anything else, the inimitable Lalgudi Jayaraman (1930-2013). And for a vocal version, I can present no other than the Maestro with a voice like nectar, Dr.Balamuralikrishna (1930-). He was a man who pushed the boundaries of tradition in his time and is a living legend now. Alternate link : in Sangeethapriya, accessible with a free account. Next I would like to recommend a very interesting interpretation by the great Veena player, Chitti Babu (1936-1996). I was surprised to note the Vedic hymn style notes produced in the alapana and in the thanam as well, something I associate with Revati, not Charukesi. It ends abruptly, but still do listen, this raga sounds particularly beautiful on the Veena. I do not speak Telugu and have sourced the lyrics and translation from various internet sources, especially Tyagaraja Vaibhavam. This I have calibrated against multiple performances and modified as seemed fit. Is it just, O Lord Rama, this whim of not talking to me who considers you alone to be as constant as a shadow, when I have held your feet with so much devotion? O Merciful Lord! Is it not true that when the erudite Anjaneya, born of the Wind God, who is also an aspect of Lord Shiva, saluted you, you asked your younger brother to convey the details to him? However, is this whim of yours in not replying to this Tyagaraja just? 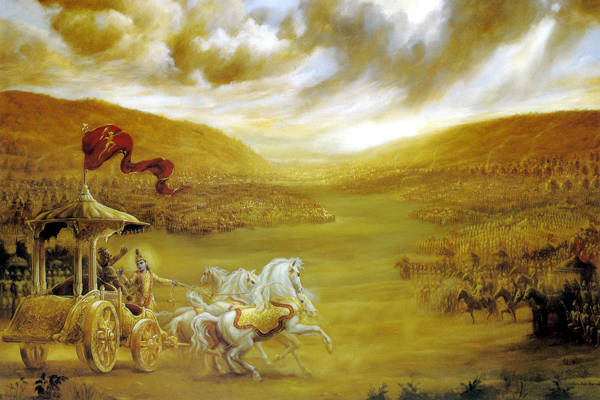 I was seven or eight when I first heard of the Bhagavat Gita. My mother registered my sister and me into Chinamaya Mission’s program for young ones. Chanting the Gita was one of the activities. I even learnt the whole of chapter 7 by heart for a competition, and what’s more, I won a prize for it too! Not that I understood anything much at that time. Subsequently I have read some summaries and heard some lectures but have not really delved into the Gita. I would tell myself ‘I really should read it at least once from end to end’ but I never got around to it. Well, last week I finally embarked on my long time goal. I hope to have the two-fold benefit of understanding the basic ideas of the Gita and improving my Sanskrit at the same time. I am not going to rush through it, after all, what is the hurry? Why am I telling you all this? Well, if you see me quote from the Gita every now and then, don’t take me for some erudite vidushi! I am just stumbling along my first word-for-word read of the Gita and no doubt it will filter down into this blog as well. What did Pandu’s son and my sons do when they assembled on the sacred (Dharmic) plain of Kurukshetra, eager for battle, O Sanjaya? Note how he refers to the battleground as धर्म क्षेत्र or the field of Dharma, a word which encompasses so much from righteousness, duty, religion, virtue, justice, morality, propriety to law. That is the field for which the Gita was written. The theme of this chapter is Arjuna’s grief. Those who know the Mahabharata know that the Pandavas had come upon this point after many years of injustice, treachery, insults and even murder attempts. They had not lightly decided on this course of war with their kin. Yet when Arjuna sees his grandfather, uncles, gurus, sons, grandsons, in-laws, cousins and friends arrayed before him on either side of the battlefield, he is overcome with the magnitude of what is happening. ‘What am I doing it all for?’, he seems to ask Krishna, his charioteer, in this verse. He is a shaken man. His limbs tremble, his skin feels as if it burns, his mouth is dry. We can hardly recognize the great and experienced warrior that he was in these descriptions. His main fear seems to be that of accumulating the great sin of destroying his family. Alas! We have resolved to commit a great sin, inasmuch as we are endeavouring to slay our kinsmen out of craving for the pleasures of dominion. It seems to me that he was more worried about gathering sins than the loss of dear ones. Whatever it was, I feel most sympathetic with him and wonder how the story would have gone if he had walked away from the battlefield then? The theme song of the day? What came to mind immediately was ‘Sthirata Nahi Nahi Re’ by Sadasiva Brahmendra. ‘There is no stability of mind’ says the poet. ‘We are engrossed in this ocean of three kinds of sorrow, caged by arrogance and egotism’ he says. Arjuna too felt deep sorrow at his situation, a situation which came about partly by arrogance and egotism as well. ‘Minds wrapped up with the bond of things, perplexed by wrong or contrary knowledge’. Interesting that vishaya can be interpreted as objects but also as country or land. Is that not what the Pandaves were, bound to their desire for land? For lyrics and translation, see footnote. The song was made his own by the incomparable Maestro Balamuralikrishna. I believe it was set to music by him for the film Dharma Nirnayam but I cannot confirm this. It is set to Raga Amrutavarshini here but this poem has been sung in different ragas by different artists. To know more about this raga, click here. We are engrossed in this ocean of three kinds of sorrow (note: Adidaivika (Divine), Adhibhoutika (of the body) and Adhyatmika (of the soul)), caged by arrogance and egotism. Minds wrapped up with the bond of things, perplexed by wrong or contrary knowledge. Opposed to union with ascetics, their achieving of joy is very uncertain. When a reader requested me to write on this song last week, it was easy for me to acquiesce. I have listened to and enjoyed Pibare Ramarasam for many years after all. I always prepare myself for writing a post by listening to multiple renditions of a song, both vocal and instrumental; I want the song to permeate my being, I want to absorb the words, the meaning, the sounds, the emotions and the moods invoked by a piece of music before being able to write of it. I also listened to a lot of Raga Ahir Bhairav in Hindustani Music and what a pleasure that was! To know more about this raga, click here. Coming back to Pibare Ramarasam, I kept getting distracted by the mispronunciations of Sanskrit by almost all the vocalists. पिबरे (pibarE) pronounced as पिभरे (pibharE) is bad enough, but as बिबरे (bibarE)? I shudder!! Even the maestro who can normally be depended on to pronounce Sanskrit correctly slipped up; I distinctly heard पीठम् (pITam) instead of पीतम् (pItam) which changes the meaning totally. As this hobby horse of mine threatened to take over this post, I have put my rants in a separate page, the better to refer to it in future posts when my annoyance at mispronunciations takes over everything else! To read my rants, click here; I need an audience for my rants and raves too!! In the meanwhile, I beg vocalists and students to please please learn Sanskrit compositions in Devanagari script and learn to pronounce the words properly. Please. It is indeed appropriate to stress on pronunciation in relation to this song; after all, the poet talks of the power of the name of Rama, the power of the sound itself. Sadasiva Brahmendra (17th-18th century) was an avadhoota, an ascetic who had renounced everything, and who has contributed some beautiful and mystical works to Carnatic Music. ‘Drink the essence of the name of Rama, O tongue’, the poet extolls, ‘for it will keep you far from sins and fulfill you with many rewards’. This is not a reminder for the mind, but a reminder for the tongue. This is an acknowledgement of the power of the sound energy in the name of Rama. Hinduism has always recognized the power of sound. I had written of this in a post last year, of Mantras and Bija Mantras and the power they carry. Sadasiva Brahmendra says that so too is the power of the name of Rama. ‘The poet then goes on to describe the rewards, such as ‘removal of the grief of the birth-death cycle’, ‘purify even the worst of sinners’ etc. For full lyrics and translation, see footnote. This song used to be sung in Yamuna Kalyani but the great Maestro Balamuralikrishna has made his Ahir Bhairav version very popular. I have a great affection for this latter raga; the notes themselves seem to imbue the song with a deep mystical sense. There is no question about it, the Maestro’s version is the best, especially if you listen to the ones sung when his voice was at its peak. If you haven’t heard him, here is a link. But wanting to present an alternate version, I have selected a very pleasant and peaceful rendition by Unnikrishnan. Click here to listen. For an instrumental version, there is this perfect little rendition by flute Maestro Shashank. Ahir Bhairav and the flute seem to have been made for each other! Note: Its common to sing only lines 1,3 and 5 but I have heard a complete version too. Drink (verb piban) (implied: absorb) the essence (rasam) of the name of Rama, o tongue (rasana). It will help you (implied) remove or be distant (doori krta) from association with sin(pAtaka) (or be distant from those who cause you to sin) and you will be fulfilled (poorita) with many kinds (nAnAvidha) and types (varga) of rewards/gains (phala). It will help you be far removed (vidUram) from the grief (shOka) of the cycle of birth and death (janana–maraNa), it is the essence (sAram) of all (sakala) the religious treatises (shAstra), the Vedas (nigama) and sciences (Agama). It protects (paripAlita) all creation. Brahma was born of a lotus (sarasija) from a golden egg (garbha anda, womb & egg) and then he created the whole universe. So this phrase implies that Rama nama protects the whole universe. It will purify (pavitrI) even the most (parama) impious or heretic (pAshANDam). It is the pure (shuddha) song (gItam) that paramahamsa (signature of poet) has taken refuge in (Ashrama/Ashrita), it is the same which has been drunk (pItam) by sages like Shuka, Shaunaka and Kaushika. It was the year 1844. In Vaiyacheri, a small hamlet in Tanjore district of Tamizh Nadu, a family was blessed with their third son. Was it his good Karma that he was born to an accomplished musician? Or was the good Karma of the father that he was given a son of extraordinary musical talent? Perhaps both. The father had the knowledge to recognize talent and foster it. And so two of the four boys of the family became accomplished musicians at a tender age. This boy was only 7 and his brother 11 when they gave their first concert. His fame grew quickly. From time to time this earth is blessed with young musicians who seem to know much more than it is possible to know at their age. Mozart composed at 5. Beethoven was 7 at the time of his first public performance. Lalgudi Jayaraman started his musical career at 12. Do you not think that their skills must have been honed in previous lives to achieve what they did at such young ages? The hero of my story was blessed not only with vidwat (knowledge) but also a pleasing voice which ranged over three and a half octaves. In the year 1856, when he was 12 years old, he and his brother were staying with the pontif at Kalladurichi when a musical festival was held. He performed with other illustrious musicians of his times. But it was his solo performance of the composition of Tyagaraja, Sugunamule, in raga Chakravaham, which won most appreciation. The pontif bestowed the title ‘Maha’ (Great) to this young lad. The lad was henceforth called Maha Vaidyanatha Sivan. He lived a life for music. He was only 49 when he passed away in 1893. He left behind a small body of compositions of which his magnum-opus was the 72 Mela Ragamalika. To honour him today, I present Tyagaraja’s composition Sugunamule which earned him his title of greatness at so young an age. ‘Not knowing any other method, in the vain hope that this would make you come, I just keep talking of your virtues’ sings Tyagaraja to his ishta daivam, Lord Rama. I like the simplicity of the lyrics, it touches my heart. Are we not all in the same boat, we believers in whichever Gods we believe in? Do we not blindly pray, hoping, believing that He or She would be listening? To know more about the raga Chakravaham, click here. I have chosen a rendition by the inimitable Dr.Balamuralikrishna whose Chakravaham I like better than any other vocalist. For an instrumental version, listen below to a lovely performance by Ganesh and Kumaresh on the violin. I do not know to perform meritorious acts such as dips in holy rivers, recitation of the Vedas etc. Kindly forgive me, O consort of Lakshmi, O Lord praised by this Tyagaraja.